The Hon. Elizabeth St. Leger, "The Lady Freemason". The Hon. Mrs. Elizabeth Aldworth, nee St. Leger, “The Lady Freemason”, was the daughter of Arthur, 1st Viscount Doneraile, himself a Freemason. The account of her membership of the Order is well-known, but well worth recounting in full, as it shows not only the Masonic pedigree of Arthur St. Leger, 3rd Viscount Doneraile (7th August, 1718 - August, 1750), Grand Master in 1740, but probably more importantly, from a Masonic history perspective, that Freemasonry was being practiced in Ireland many years in advance of the first recorded meeting of Grand Lodge in 1725. 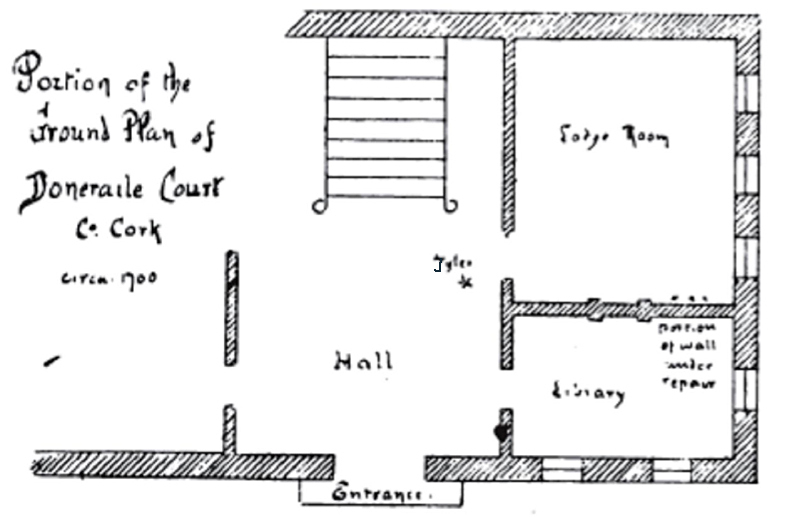 In or about the year 1710-12, a Lodge was being held at Doneraile Court, the family home of the St. Legers - where the young Miss St. Leger, whether by accident or design, witnessed from an adjoining apartment, some portion of the mysterious ceremonies taking place. The young Lady took alarm and made an attempt to slip away, however her presence was noticed by the Tyler, and the Brethren were warned of the presence of an intruder. The following account, derived from a memoir of her life, published in Cork in 1811, describes the dramatic development which ensued . . .
"Part of the wall dividing the Lodge Room from the library was being removed for the purpose of making an arch and thus connecting the two rooms; some of the bricks in the dividing wall had been removed and only loosely replaced. While the alterations were in progress, Viscount Doneraile and others met in the Lodge Room for Masonic purposes and to confer degrees. On this particular afternoon, Miss St. Leger had been reading at the library window and, the light of the winter afternoon having failed, fell asleep. The sound of voices in the next room restored her to consciousness and from her position behind the loosely placed bricks of the dividing wall she easily realised that something unusual was taking place in the next room. The light shining through the unfilled spaces in the temporary wall attracted her attention and, prompted by a not unnatural curiosity, Miss St. Leger appears to have removed one or more of the loose bricks, and thus was easily enabled to watch the proceedings of the Lodge. For some time her interest in what was transpiring was sufficiently powerful to hold her spell-bound; the quietness of her mind remained undisturbed for a considerable period and it was not until she realised the solemnity of the responsibilities undertaken by the candidate that she understood the terrible consequences of her action. The wish to hide her secret by making good her retreat took full possession of her thoughts, for it must be fully understood that although she was perfectly aware that her father's Lodge was held at the house, she had no idea on entering the library that on that evening a meeting was about to be held in the adjoining room. Her only means of exit was through the Lodge Room and we can well understand what must have been the feeling of the young girl when she realised that the only way to escape was through the very room where the concluding part of the Second Degree was being given. The door being at the far end of the room, she had sufficient resolution to attempt her escape that way. With light and trembling step, and almost suspended breath, she glided along, unobserved by the Lodge, laid her hand on the handle and, softly opening the door, before her stood her father's butler, the grim and faithful Tyler, with drawn sword in his hand, guarding the entrance. Her shriek alarmed the Lodge and the Brethren, having carried the young girl back into the library, learned what had occurred. Leaving her in charge of some of the members, they returned to the Lodge and discussed what course, under the circumstances, they had best pursue. The discussion was carried on for a considerable time, after which they returned, and having acquainted Miss St. Leger with the great responsibilities she had unwittingly taken upon herself, pointed out that only one course was open to them. The fair culprit, with a high sense of honour, at once consented to pass through the impressive ceremonials she had already in part witnessed." The Lodge that night was presided over by her father, Lord Doneraile, and her brother (the 3rd Viscount, father of the 4th Viscount, Grand Master) was present. It is said that Mr. Richard Aldworth, whom she subsequently married, was also present. Having been initiated the young Lady attained great eminence in the Craft, and was a well-known figure in Masonic Ceremonies, and processions on public occasions. Jewel worn by Elizabeth St. Leger. Inscription on the rear of the Jewel. The Hon. Mrs. Aldworth died in 1773, aged 80, and was buried in the Davies vault in the old St. Finnbarr Cathedral, Cork. A mural tablet to her memory was placed in the parish church of Doneraile. The remains of the Hon. Mrs. Aldworth, appear to have been seen in after years by the late Dr. Richard Caulfield, shortly before the erection of the present Cathedral of St. Finbarre. Writing on the subject he says, (the body of the venerable lady was enclosed in a leaden shell and in a wonderful state of preservation.) "She was attired in a dark silk dress, white satin shoes, stockings of a similar colour. Her person was comely; her face of a dusky or ash colour; her features quite perfect and calm. She wore long silk gloves, which extended above the embroidered wristbands...... she wore a white head-dress, with a frill round her neck, the pleats of which were not even ruffled." The stone slab which covered the vault, having become undecipherable by age, was moved when the present Cathedral was built, and finally placed in the floor of the small chamber situated in the great tower. The above plaque was erected at the new St. Finbarre's Cathedral by the Freemasons of Cork. Plaque erected at the new St. Finbarre's Cathedral by the Freemasons of Cork. There has been considerable interest in the Hon. Elizabeth St. Leger by masonic scholars over the years. It was initially suggested by earlier masonic historians that her Initiation took place much later than the now accepted date of 1710-12. Two well-known masonic scholars, Bro. Edward Conder, a member of Quatuor Coronati Lodge No. 2076 and Bro. W.J. Chetwode Crawley have shown in two papers, both published in Volume VIII (1895) of Ars Quatuor Coronatorum, that "The Lady Freemason" was initiated in the the Craft much earlier than had previously accepted at that time. The drawing of the Jewel above was reproduced from the pamphlet to the left. As you can see the pamphlet is American, published on the 3rd November, 1860 and is a reprint of the original published in Cork in 1811. It shows the worldwide interest regarding "the Lady Freemason". You will note that the dates set out in the recounting of Miss St. Leger's Initiation are those previously accepted before the research of Bro. Conder and Bro. Crawley. A .pdf copy of the pamphlet can be accessed by "clicking on the image to the left. Elizabeth St. Leger was said to be a patroness of the Craft through her long life. Her portrait to the right shows her wearing the distinguishing masonic jewel of an early craftsman, the trowel pendant from the left shoulder. Miniature Portrait of Elizabeth St. Leger. You will see from Bro. Conder's paper that the missing part of his research was the date of marriage of Elizabeth St. Leger to Richard Aldworth - this missing piece of the "jigsaw" was important because it was accepted that she was initiated into the Craft prior to her marriage. It was through the good offices of Bro. Crawley, the renowned Irish Masonic historian and also a member of Quatuor Coronati Lodge No. 2076, that the marriage certificate dated 1713 was located. Marriage Certificate dated 17th April, 1713. Elizabeth St. Leger's Masonic Apron presented to the Provincial Grand Lodge of Munster in the early part of the 20th Century by Colonel R.W. Aldworth, her descendant.
. The original painting above and Apron of “The Lady Freemason” are on display at the Masonic Hall, Tuckey Street, Cork.
. Mrs. Richard Aldworth is listed as the second subscriber to Fifield D'Assigny's 1744 “Serious & Impartial Enquiry”, after the Grand Master.
. The dates in the plaque are wrong in that it has been established that the correct year of birth was 1693 and her date of death was in 1783. Furthermore the Lodge at Doneraile House would not have been known as Lodge No. 44 as a Warrant was not issued to the Brethren of Doneraile until either December 1735 or April 1736 (There is no record of the issue of this warrant in the Grand Lodge Register, but issued probably either in December 1735 or April 1736). The original Lodge No. 44 could probably be regarded as a "time immemorial" Lodge. The Grand Lodge record shows Warrant No. 44 at Doneraile in 1791, something that neither Bro. Conder or Bro. Crawley were aware of when composing their Papers. The 1811 memoir referred to above also listed Lord Doneraile as Worshipful Master and Arundel Hill as Senior Warden of the Brethren who were probably constituted as Lodge 44 (vide Transactions of Lodge of Research, 1927. p. 199) (In 1885, on the death of Canon Arundel Hill – a lineal descendant of Br. Arundel Hill who was present when Elizabeth St. Leger was made a Freemason at Doneraile Court – his widow gave to Lodge No. 555 a picture of the Hon. Mrs Aldworth, the Lady Freemason, which was hung in their Lodge Room as a memorial to her husband, their late chaplain).